This story just isn't true within the sense that most people use that word. It emerges out of the mists of time, rooted deep within the heritage of Britain and western spirituality. It's a weave of mythologies, theologies, traditions, and histories. It has no beginning, and it has no ending. The story stands upon the traditions of two mythical characters: the Girl of Avalon, and Joseph of Arimathea. However the land is itself a residing character within the story, as is the surrounding marsh, the invading Roman legion, and a really particular cup of blue glass that unites them all. The legend of the Woman emerges from the Arthurian literature, but predates and underlies the story of Arthur by some four hundred years. Vivian is a Lady who is already the stuff of delusion by the time Arthur meets the Girl of the Lake. She is the sovereignty of the land itself, the spirit of the mud and dark water of the marshes, seer of an historic individuals, priestess of the Isle of Mist, and keeper of the apples. She clings to the ancient earth for her folks at a time when the old Druids are discovering new connections to a Roman culture they are now not able to defeat. At the time of the story, which we might at this time name as 45 CE, the Roman invasion below Emperor Claudius is two years old. Vespasian is leading the II Augusta Legion throughout the southwest of Britain, fast approaching the good inland sea, which is the realm of Avalon. Historical Britain will soon be Roman. Into this ferment comes Joseph of Arimathea, nice-uncle of Jesus of Nazareth. Traditions of Joseph abound in the Cornwall and Somerset areas of England. Joseph, the Cornish tin and lead merchant, mine proprietor and supplier of metals to the Roman army across the Empire. In accordance with tradition, Eosaidh made many trips from Palestine to the mines of Cornwall and the Mendip hills north of Avalon, and on some event introduced his nephew with him. Eosaidh, Vivian, and "the Lad" have all met before, years earlier than this story begins. And Vivian has already had profound, but different, affect upon them both. The underlying images within the tale are the Cup of Life, later to grow to be often called the "Holy Grail," the Apple bushes of sacred and fertile Avalon, and the Hawthorn workers of Eosaidh's tradition. It's a story of the coming of the Jesus custom to the traditional world of Avalon, and what happens when these worlds collide. However there is surprising battle, too, when Eosaidh is confronted with the new "church," bringing a cult of Jesus that even he cannot accept. Ultimately, Eosaidh should selected between Avalon and Jerusalem, between two loves. And this is truly a love story. For the worldviews that meet, and clash, and dance and conflict once more do not achieve this in the abstract. Eosaidh and Vivian are flesh and blood. Their struggle to understand each other, and certainly themselves, takes them out of the realm of theological debate into the whirlwind of human emotion. As the story unfolds, Vivian and Eosaidh focus on the story of the Lad, and discover collectively questions of the nature of God, humanity, gender, honor, hope, historical past, ethics, spirituality, and, all the time, the underlying presence and which means of the land. They alternately succeed and fail in understanding each other. They fall deeply in love, are separated by the tides of circumstance, find each other, and are separated again. The rising depth of their mental connection is matched by the rising depth of their heart longing. What could be a piece of theology becomes instead the most powerful of affection stories. And that is because it should be. The work is a collaboration between a British Druid leader, Emma Restall Orr, and an (admittedly unconventional) American Episcopal Priest, Walter William Melnyk. We chose this format to be able to allow the characters of Vivian and Eosaidh to be as genuine as possible. We each wrote our personal characters within the first particular person, present, and alternated narrator responsibility chapter by chapter. 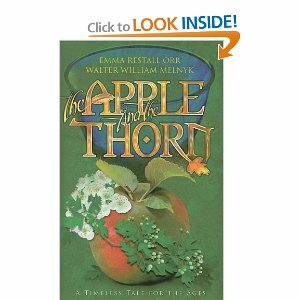 Thank you for reading the article about The Apple and the Thorn by Emma Restall-Orr. If you want to duplicate this article you are expected to include links http://helpdesksoftwarepdfebooks.blogspot.com/2013/08/the-apple-and-thorn-by-emma-restall-orr.html. Thank you for your attention.